So the Disneyland 10K went off today as planned — with great success. The full story to come tomorrow. Today is about resting and preparing. Preparing for the Half Marathon tomorrow. It will be like today’s race’s bigger brother! And there is a lot at stake! Today, in addition to earning each other’s love and mutual admiration — Erin and I also earned the 10K finisher’s medal — which was themed in Alice In Wonderland. Pictures tomorrow, promise! Because I am also running the Half Marathon, I get a shot to earn the Half Marathon finisher’s medal. 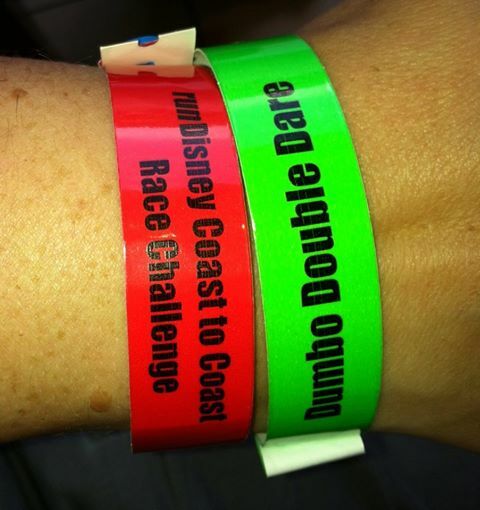 AND because I am signed up for these races as a Dumbo Double Dare participant — I can also earn a third Dumbo themed medal! Holy Moly! Well, as if THAT were not enough — because I ran the Marathon in Florida in January — I am also eligible to earn what Disney calls the Coast-to-Coast medal. It is given to any runner who completes 1 race in Florida (13.1 miles or longer) and 1 race in California (13.1 miles or longer) in the same calendar year. 2013 is that year for me! Right now, I am loaded up with wrist bands that identify me as eligible for these medals. The o.n.l.y. thing I have to do is — well — run and finish the Disneyland Half Marathon tomorrow. Yup — it’s an all-or-nothing scenario. 3 beautiful pieces of bling for 1 race — OR — Zip. Zilch. Nada. Plan of Attack: A light dinner. More ice on the foot. Foot brace overnight. Good sound sleep. 3:30am wake up. Favorite running shoes. Some Coppertone. Two bottles of Gatorade +water. A banana and a fuel gel. Then I go kick some Half Marathon @ss!